Due to an unparalleled commitment to providing outstanding customer service as Northwest Valley Realtors specializing in Sun City / Sun City West home sales and property purchases, many satisfied real estate customers have submitted letters of thanks and some greatly appreciated reviews regarding our real estate services. Nancy is simply the best! Throughout the years she has helped us sell our old house, find a commercial rental for my business, and most recently buy our dream house. She's always quick with an answer to every question, no matter how off the wall or simple. She has plenty of helpful advice and strategies on how to navigate all the steps through buying and selling. And you always feel like her number one customer. Her whiteboard in her office has your name and details up with progress on your house marked, so she always knows what's next in the process. I highly recommend Nancy for any Real Estate transaction! Nancy was awesome, there were a few "bumps in the road" during my purchase process and she helped me through wonderfully. She was so understanding and compassionate of a difficult emotional time I was going through at the same time and "held my hand" through the whole process. One of the difficulties appeared to me too be a non-responsive selling agent, and Nancy did some off the other agents work too, what ever our took, just to make sure I was taken care of. She knows the quirks of the area and was usually available when I called and quickly returned my calls the few times she wasn't immediately available. She is highly recommended! Nancy and Wade helped us find a Sun City golf course property that met our unusual needs. It took months of looking but Nancy didn't give up on finding us a property even when I despaired of ever finding the right house. When it came time to sell our existing property, I intended to do some updates before listing but they said most of what I wanted to do wasn't necessary and they were right! They helped price it right and it sold the first day on the market. The Zell's are delightful to work with, know the ins and outs of the business, and kept us informed every step of the way. Thank you, Zell team! It took 8 months of house hunting to finally find 'our' house but Nancy stuck with us through the entire grueling search. She has many years experience in the Sun City market which was very helpful. I'm from Wisconsin and wasn't familiar with Arizona's real estate practices so her knowledge was very reassuring as we proceeded through the closing. I particularly appreciated her straightforward manner and was very comfortable working with her. I'm confident she'll work hard to sell my existing home so there was no doubt I'd list with her. 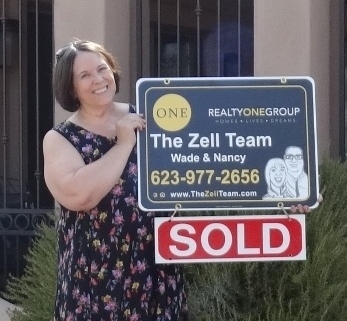 If you want a seasoned realtor who's easy to work with and knows what's happening in the Sun City market, I encourage you to try Nancy. This section is designed to give you some ideas of the level of service that we can provide as your knowledgeable local neighborhood Realtor. Receiving thanks from clients who have had successful real estate purchases is largely due to the fact that we always assess the needs of our real estate clients and provide them with a level of service that is second to none whether that be for a luxury property or a bank owned fix-up!